The nonprofit Vision To Learn, the Los Angeles Clippers Foundation and the Long Beach Unified School District announced an effort this month to provide free eyeglasses to every LBUSD child in need throughout grades K-12. Long Beach will be the largest school district in the nation to implement the program. The project will support every LBUSD school from now through the end of 2017, serving thousands of students. In 2016 the project supported a project serving every student in need throughout Inglewood. 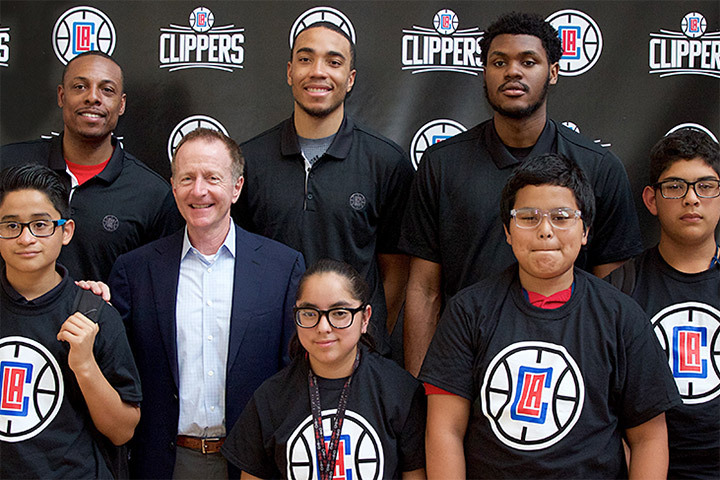 “We are honored to continue this critical partnership and have the opportunity to provide much-needed vision care for thousands of students across our community,” said LA Clippers President Gillian Zucker. Members of LBUSD’s Board of Education, Long Beach Mayor Robert Garcia and LBUSD Superintendent Christopher J. Steinhauser attended the announcement event at Washington Middle School, where 58 students received free glasses from the program. Vision To Learn brings mobile clinics to schools. Students who don’t pass a basic vision screening receive a vision exam from an eye care professional. Glasses are then provided at no cost for children who need them. Since Vision To Learn first began helping children in Long Beach in September 2014, more than 2,200 students in the school district have been provided eye exams, and more than 1,600 of those have been provided with free glasses. The collaboration with the Clippers Foundation will allow the program to serve about 4,000 more students who need glasses. Founded in 2012, Vision To Learn’s mobile clinics and licensed optometrists visit schools and youth service programs in 176 cities. The organization has screened more than 420,000 children, examined almost 75,000, and provided almost 60,000 with glasses, all free of charge.